It's day two of World War II Week. 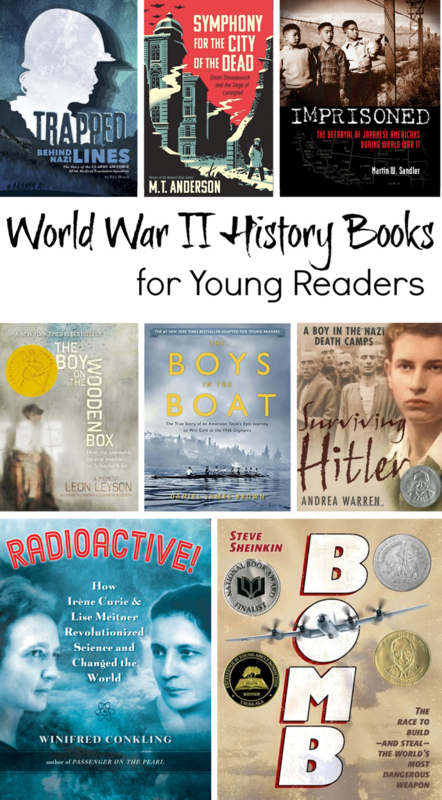 Today we have a fabulous bunch of nonfiction books about World War II all aimed to young readers (but great for older readers too). This collection covers a wide array of topics including military history, science, athletics, Holocaust survival stories, and more. The 807th Medical Evacuation Squadron crash landed in Nazi-occupied Albania. It took them three months and a hike of over 1000 miles to reach the sea and an evacuation boat. They battled blizzards and had many close calls with Nazis and Nazi sympathizers. Along the way they were aided by local partisans and several British Special Operatives. It was really interesting to learn about the occupation in Albania and what the locals and Allies were doing to thwart the Nazis. Out March 1st, 2016. Sandler's book is a history of the Japanese American experience during World War II. In addition to the several chapters devoted to the internment, Sandler also delves into the contributions of Japanese American who served as GIs and in Intelligence. Although designed to read a bit more like a textbook than a narrative, the history is aided by photographs and visuals on nearly every page. Leon Leyson was ten years old when the Nazis invaded Poland. This book is a memoir of his young life. He experienced the Krakow ghetto, survived the Plaszow concentration camp, and was eventually taken under the wing of Oskar Schindler. As one of the youngest children on Schindler's famous list, Leyson's story is the perfect way to introduce young readers to that amazing story of bravery, compassion, and intelligence. Daniel James Brown tells the story of the winning oarsmen in the 1936 Berlin Olympics. All amateur athletes from the University of Washington, they had grown up in the Depression Era. The technical, strenuous, and mentally exhausting sport of rowing, Nazi Germany, and that fact that these were all amateur athletes from modest backgrounds adds to the power of this story. And, as an added bonus, you can watch the winning race on YouTube. Like Leon Leyson, Jack Mandelbaum was a young boy when the Nazis invaded Poland. He, however, was quickly separated from his family and sent to Blechhammer concentration camp. Left to survive on his own, Jack's tale is one of fortitude and endurance. Andrea Warren excels at writing nonfiction for young readers. She deftly conveys the tragedies and triumphs of Jack's life. Tomorrow we'll be bringing you a group of novels that explore aspects and events of the World War II era that are a little less well known.